Chelsea is undoubtedly one of London’s most affluent areas and its landscape is constantly changing. With new apartment blocks springing up everywhere, and property conversions rife, you’ll often see skips outside buildings or on construction sites. The chances are that several of them will be ours. We’re one of London’s premier skip hire and waste management companies and have been trading for over 25 years, so you can be sure that dealing with us will be a smooth and hassle-free experience if you need to book a skip in Chelsea. We’re based just south of the river in Battersea, so there won’t be any delay in delivering a skip to your Chelsea home or business. If you’re lucky enough to own a house with a garden or garage in Chelsea, there are times when you’ll need a skip to clear away all that unwanted junk. It could be a simple case of a general clearout or perhaps you’ve just had a new kitchen or bathroom. If you live in one of Chelsea’s many flats we can help you declutter your apartment with a quick and easy skip hire solution. We offer professional one-off skip hire for all kinds of businesses in Chelsea and we can also offer great prices for regular contract bookings. Regardless of whether you just need one of our smaller skips for a one-off project or run a larger business in the area with an ongoing waste stream, we have a skip that’s right for the job so get in touch today to discuss your requirements. If you’re a property developer in Chelsea, you’ll know that space is at a premium. We provide a range of skip sizes to choose from, so you can pick the size that’s right for your project. If required, we can also give free help and advice with arranging a permit if required. Whitehall, Victoria, Westminster, Pimlico, Belgravia, Kensington, Knightsbridge, St James’s and West Brompton. If any of the above scenarios apply to you, get in touch with Metro Waste to see how we can help you clear away your waste in Chelsea SW1, SW3 and SW10 with one of our London skips. Chelsea Skip Hire Not an Option? There are times when a skip just isn’t suitable for the job. 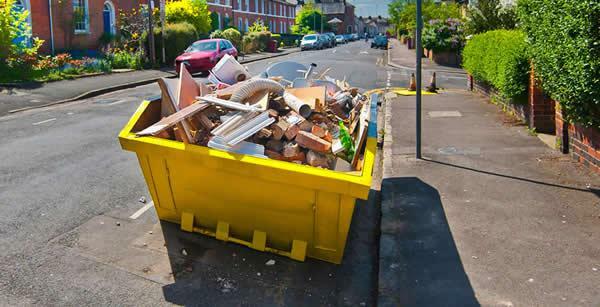 Our Chelsea rubbish clearance service is a great alternative – and we do all the hard work! With a huge capacity of 13.6 cubic metres, our tipper trucks are able to remove either full or part loads, so you’ll only pay for what we take. The Chelsea Flower Show was formerly known as the The Great Spring Show and was first held in 1862 at the RHS garden in Kensington. Before this date the RHS had held flower shows from 1833 in their garden in Chiswick, which themselves had been preceded by fetes. The Great Spring Show was held at Kensington for 26 years but in 1888 the RHS decided to move the show to the heart of London. The site chosen was the Temple Gardens, situated between the Embankment and Fleet Street, which had a recorded history dating back to 1307. The roses for which these Temple Gardens were famous were alluded to in Shakespeare’s Henry VI Part 1.